My employer, a local university, used WebCT as its Learning Management System for years. WebCT’s user support was great when we originally adopted it, but that support grew poorer over time. We heard they were being purchased by BlackBoard, a company that had (at the time) even worse reports of poor customer responsiveness for smaller universities like ours. (I don’t know what their reputation is since the merger.) We planned a move to Desire2Learn, and backed up all of the existing courses in WebCT in case they were needed in the future. Recently we tried to recover two of those old courses–one from 2002 and one from 2009. We’d used WebCT to make Zip-formatted backups for us. Unfortunately WebCT modified those backups by altering the files it created so that Zip extraction utilities wouldn’t recognize them. Of course, if you wanted to recover those files in WebCT the program would happily read them and re-import their information. Which means you needed to have a working, currently licensed installation of the program. That’s an expensive proposition and is an unreasonable expectation. The co-worker reported he’d had success using the old iMac/Stuffit combination. Since I was PC/Windows based and I knew we’d need a more modern way to recover the files in the future, I pressed on. It struck me that these programs all reported the same error–a corrupt file–so I ran them through a free Windows utility called DiskInternals ZIP Repair. The files were then readable and extractable by 7-Zip (my program of choice). After the co-worker compared my extraction and his, he said that my method recovered more files than his method. 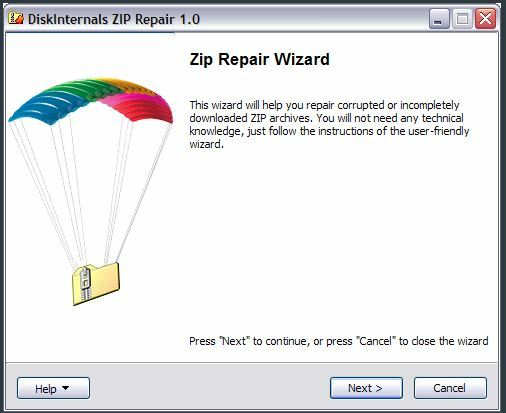 If you find yourself in this situation, don’t hesitate to try DiskInternals ZIP Repair.